WASHINGTON (Dec. 18, 2009) -- On the 65th anniversary of the Battle of the Bulge, veterans of that conflict were recognized by the countries whose freedom they helped secure. On Dec. 16, 1944, the Germans launched an offensive through the Ardennes Mountains region of Belgium, France and Luxembourg. More than 800,000 American Soldiers fought back, and became participants in the largest single battle in U.S. Army history. After nine days of fighting, and nearly 90,000 casualties, American Soldiers had kept Germany from reaching its goal: capturing Antwerp, Belgium, and putting themselves in a position to force Allies into a peace treaty favorable to the Axis. 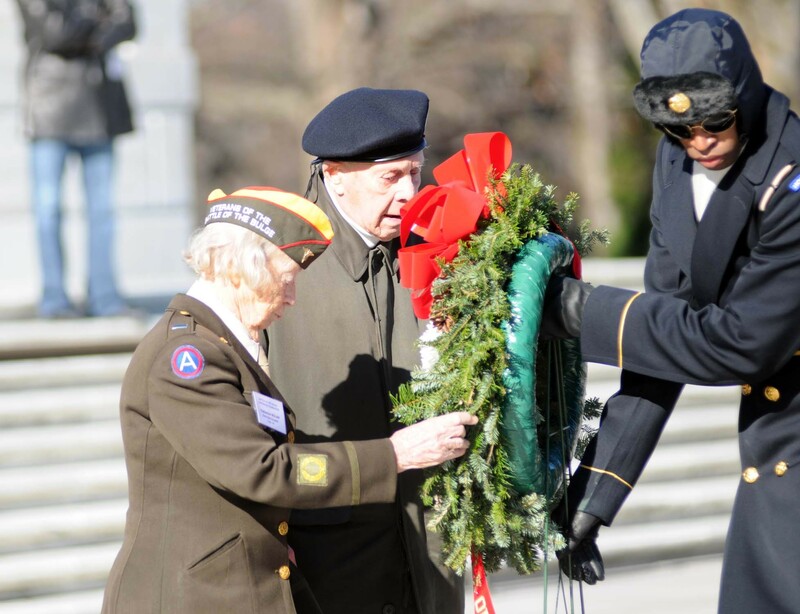 Veterans of the Battle of the Bulge lay a wreath at the Tomb of the Unknowns in Arlington National Cemetery, on Dec. 16 -- the 65th anniversary of the start of the battle. More than 60 veterans from the Battle of the Bulge came to Washington, D.C., to commemorate the 65th anniversary of the battle. The veterans visited the White House, the Embassy of Luxembourg and the residence of the Belgian Ambassador. On Dec. 16 -- the 65th anniversary of the start of the battle -- the former Soldiers gathered at Fort Myer, Va., to watch a presentation by Soldiers of the 3rd U.S. Infantry Regiment (The Old Guard). There, Belgian Minister of Defense, Pieter De Crem, addressed the veterans, and conveyed to them the gratitude of his country. "To all of you here present, to those who came over the ocean, young men and women, to rescue us -- to those who were in the Ardennes, and in the Battle of the Bulge, in those terrible circumstances -- I want to express before you our profound respect and thank them from the bottom of our hearts for their extraordinary engagement," De Crem said. "We owe you our liberty." The minister went on to say the friendship between his nation and the United States would be enduring. "Long live our common determination for the protection of our shared values," he said. "Long live our deep and everlasting friendship between the United States of America and the Kingdom of Belgium." Nicolas Mackel, deputy chief of mission, Embassy of the Grand Duchy of Luxembourg, also spoke to the veterans, saying his countrymen are aware of the sacrifices so many young Americans made during World War II to protect freedom in Europe. "I have grown up being taught by my parents, by my grandparents, by my school teachers, about young, brave Americans who had to set aside their daily lives to come and liberate our country," Mackel said. "Like all Luxembourgers, I know that too many of your comrades did not make it back to their loved ones and were deprived of living out their dreams." Mackel said the memory of what Americans did in Europe during World War II, and especially at the Battle of the Bulge, would not be forgotten by Luxembourgers. "Like your resilience 65 years ago in the face of enemy power did not falter, our dedication to the memory of your deeds has not faltered since -- and it never will," Mackel said. "By holding out in those foxholes in the coldest of winters, you contributed decisively to bring about the final defeat of the Nazi ideology. You thus helped to bring back freedom and liberty to a whole. For this, as a Luxembourger, and in my own name, I would like to thank you very much." Darrell B. Carter, of Glenn Allen, Calif., served as part of the 99th Infantry Division at the Battle of the Bulge. He said he was impressed with the performance of the Old Guard. "I appreciate it, and I'm a little surprised at the detail of that performance we saw," he said. He also said he was impressed by the gratitude expressed by both the Belgian and Luxembourgian representatives. "I certainly appreciate that," he said. "They were the object of the attack, certainly, and we were in the way." Al Rosenzweig, a veteran who served with the 78th Infantry Division at the Battle of the Bulge, was also impressed with the international recognition of his service. "They were nice to us, the people in Luxembourg and the people in Belgium," Rosenzweig said. "I think it's a wonderful thing. The people in Belgium and Luxembourg will always be friends of the United States." Rosenzweig was just 18 when he served in Europe as part of the force that helped defeat the Nazis at the Battle of the Bulge. He remembers that the battle was a surprise to all of them. "At the time of the battle we were in a little town called Rotgen; we were the only division in Germany," Rosenzweig said. "We relieved the 8th division in the Hurtgen Forest -- that was on the extreme flank of the bulge. We had been in position about five days to a week when the bulge hit. We were told when we went into the sector that it was all quiet and that nothing was going on and everything has been secure up until this point -- and then all hell broke loose after that." As part of his combat experience, Rosenzweig said he suffered only from the extreme cold -- something he still feels today. "We were undersupplied at the time, and we didn't expect the weather to be like it was. I had no overshoes. I got frozen feet and frozen hands -- that was about the worst of my injuries, still feeling them -- twisted hands and feet," he said, showing his bent fingers. "But I'm alive and we have a lot of our beloved veterans here." Rosenzweig said he's been participating in veteran reunions since the end of the war. Following the presentation at Fort Myer, the World War II veterans traveled to nearby Arlington National Cemetery, where De Crem and Mackel laid a wreath at the Tomb of the Unknowns. The old Soldiers themselves also laid a wreath there, and then traveled on to the World War II Memorial in Washington, D.C.